No. 24 USC swept Sam Houston State in their first match of the Rice Adidas Invitational I 25-18, 25-20, 25-15. This marks the fourth straight win for USC after dropping their first three matches of the season. The Trojans hit for .311, while the Bearkats posted a .149 hitting percentage. Three Trojans had double digit kills, Khalia Lanier (11 kills), Alyse Ford (10 kills) and Brittany Abercrombie (10 kills). Bearkat Amanda Gooch led the team with eight kills, while teammates Jordyn Vaugn and Taylor Cunningham each contributed seven. Breanna Homer led all players with 15 digs. HOUSTON — The 24th-ranked USC women’s volleyball team (4-3) defeated Sam Houston State (4-4) in a three-set sweep (25-18, 25-20, 25-15) in the first match of the Rice Adidas Invitational I at the Tudor Fieldhouse on Friday, Sept. 9. The Women of Troy won their fourth straight match since opening the season with three consecutive losses. Four Trojans scored in double digits led by freshman outside hitter Khalia Lanier (13.5 points) who had 11 kills (3e, 27att, .296) to go with nine digs, a service ace, and two blocks (one solo). Sophomore outside hitter Alyse Ford (11.0 points) added 10 kills (2e, 19att) with a .421 hitting percentage and 10 digs for her first-career double-double. Ford also had one of USC’s eight service aces. Junior opposite hitter Brittany Abercrombie scored 11.5 points with 10 kills (3e, 19att, .368) and two blocks (one solo). Senior middle blocker Elise Ruddins (10.5 points) had eight kills without an error (13att) and hit .615 to go with a match-high five blocks. Senior libero Taylor Whittingham picked up 10 digs and served a pair of aces. The Trojans hit .311 (45k, 12e, 106att) with senior setter Alice Pizzasegola dishing out 15 assists with five digs. Junior setter Nikki Leonard also had 15 assists to go with six digs and a pair of service aces. For the Bearkats, Jordyn Vaugn and Taylor Cunningham had seven kills each. Amanda Gooch led the team with eight kills (0e, 21att, .381). Breanna Homer led all players with 15 digs. Sam Houston State hit .149 in the match (36k, 19e, 114att). The Women of Troy never trailed in the first set and opened up a lead as large as 10 points on several occasions before closing out the 25-18 win. The Bearkats led for much of the second frame but the Trojans caught them at 17-all and finished off the win, 25-20, on a kill by Ruddins. USC rolled out to a 7-1 lead to open the third set, and then broke things wide open with a 12-point lead at 20-8. 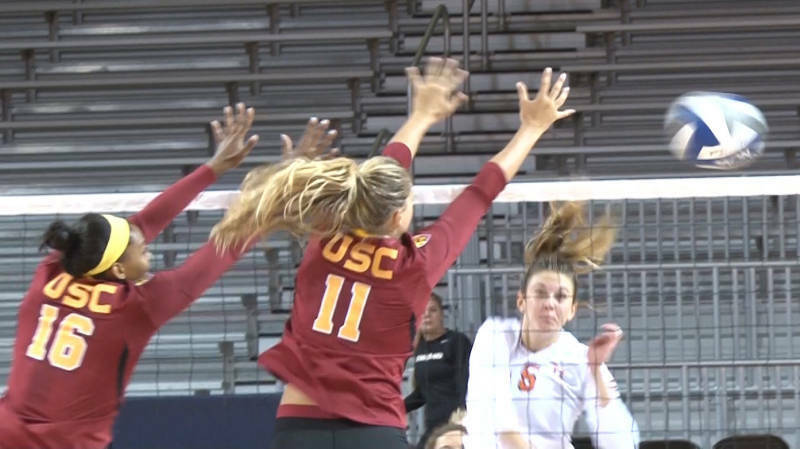 USC gave no quarter as it polished off a 25-15 win for the sweep. Up next, the Trojans face Oakland (4-3) at noon CT (10 a.m. PT) on Saturday, Sept. 10. USC then concludes the Rice Invitational against the host Owls at 7 p.m. CT (5 p.m. PT). The final match will be streamed live for a fee on ConferenceUSA.com. USC improved to 2-0 in all-time meetings with Sam Houston State (1998). The Trojans played and won their first-ever match in the city of Houston. The Women of Troy won their fourth straight match and have now won four consecutive sets. The USC victory brings head coach Mick Haley just four wins from reaching his 400th at USC (396-98). It also puts the program at just seven wins from reaching the 1,000-win threshold. Sophomore OH Alyse Ford logged her first-career double-double with 10 kills and 10 digs. HOUSTON – The Sam Houston volleyball team continued their month-long road trip to start the season Friday afternoon at the Rice Adidas Invitational with a 3-set loss to No. 24 USC. After dropping the opening set 25-18, the Kats came out looking much better in the second. The set featured 8 of the 11 total lead changes in the match, and Sam Houston led as late in the set as 17-16. But the Trojans rattled off four straight points and never looked back taking the second set 25-20. USC closed out the match with a 25-15 win in the third set. Amanda Gooch led the way for the Bearkats with 8 kills. Jordyn Vaughn and Taylor Cunningham each had seven kills, while Breanna Homer and Clair Kilpatrick each had an ace. The Bearkats will be back in action Saturday morning as they take on Rice at 10 a.m. and then wrap things up with Oakland at 5 p.m.